Post here about your two polarity variable voltage power supply kit Janus®, get help - for Augustica® customers! I'm beginning a project for which I believe the Janus PS. would be the best choice. Part of the project is a circuit consisting of 2 x 6922/6dj8 tubes, meant to serve as a buffer. It needs + and - 12 to 30 VDC, or so says the propaganda from the maker... and 12 VDC for the filiment. Consensus of subjective (listening) opinion says that around 12v just isn't enough for the 6922/6dj8 and the result is "vague" "bloated" type sound. That makes sense to me, as those tubes were intended for much greater voltage. The higher end of that range seems better..
That is where I would be very greatful for your advice and knowledge! Also, experience counts for a lot! I'm assuming that the overall limit is set by the current limit of the LM regulators? Still, I'd like to use the highest allowable voltages. The Janus would seem an ideal choice for this purpose. I would prefer to provide a seperate 12V supply for the filiments. 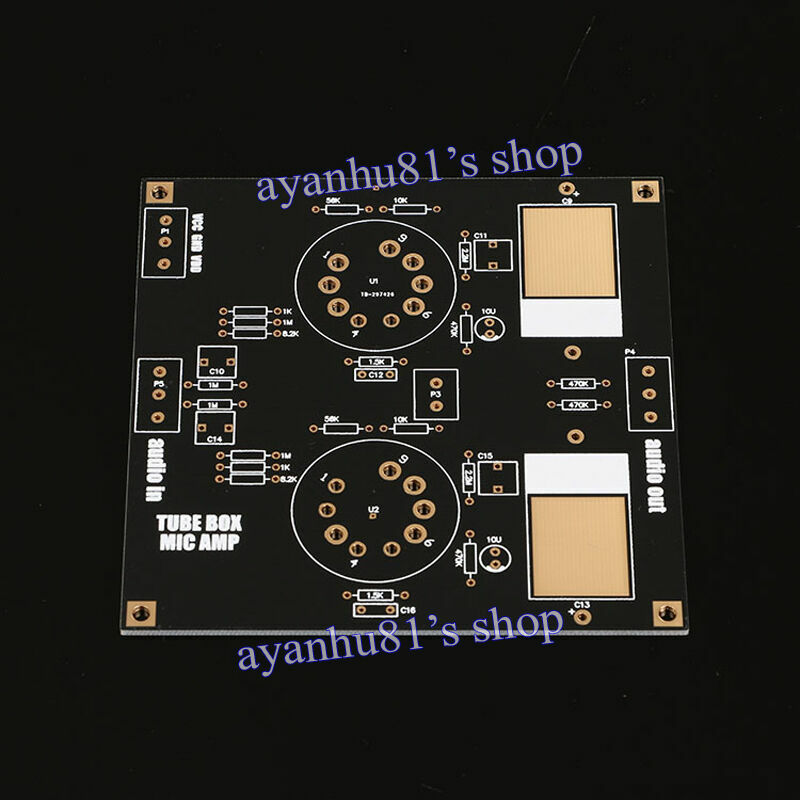 Here I'll provide the supplied schematic and photos of the board. Here is a url for it meanwhile. I would also be greatful for advice on which transformer to get (110V mains), but of course that depends on the above. Also, it bothers me to have no "soft start", like the other Augustica PS boards do. Perhaps you feel that at this voltage level its not nescessary? I should provide some further info on the overall project, to put it in some perspective. The main purpose is to build a component..... variously called a "line stage" or "control center" or "preamp"..
(though perhaps none are precisely accurate). I want to use a TVC (transformer volume controler) for attenuation. So why not just use a "passive" "preamp"? I've come to believe that impedance mismatches are a core source of problems in audio systems... and responsible for many a bad result. "System synergy" that people talk about is often a matter of good impedance matching, system-wide... I believe.. I don't need any gain.... or at least very little should it be inevitable. So, it seems to me, that buffer as the heart of a "preamp" would be a great thing! Why a tube buffer? Well, mainly because I like "tube sound"
I've heard all the debates.... and nobody will ever talk me out of it.... lol.. Even if its my imagination, I LIKE it... it just seems more like MUSIC to me.... and I find it holds my interest better.. Especially in this day of "dry" sounding digital sources. for terrible car loudspeakers... Those who cared went out of their way to find British pressings for that reason... often with little luck. That they're voltage devices seems positive too. So I've had this idea in mind for a few years.... and I'd like to test it out. Succeed or fail (sonically). A tube buffer "on either side" (at input and output) of a TVC. 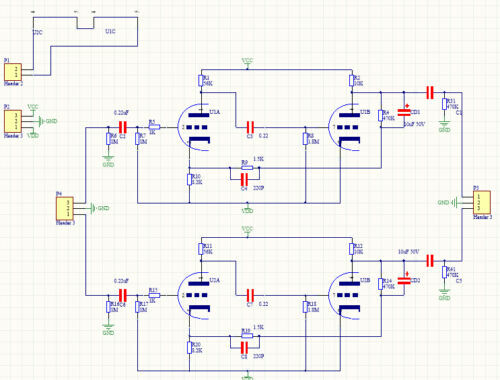 I've been describing this as for a one (mono) channel, so of course everything would have to be doubled for 2ch stereo. If seperate transformers, (and for 12v filiments) were used, it would also be dual-mono.... for a slight/reasonable additional sum. Your advice, and your boards, would be most appreciated!!! Thank you for the information. Could you please list the specific questions you have. 1) What voltage to run the tubes at? Wouldn't that actually be considered 60v? Wouldn't 60 be more ideal for best sound? What is the limiting factor, is it the LM's? 2) Which Hammond transformer would be best for that application? 3) Can "soft start" be added, like in the other PS boards? Is it not needed/overkill, etc? 4)Is there anything that can/should be done to improve the buffer boards? 5) Is the Janus the best choice for this application? Lets think of it as one (mono) channel for now... for clarity/simplicity. 1. What voltage to run the tubes at? You will have to calculate parameters using the formulas we provide on this website. Janus provides up to +30 Volt in one channel and up to -30 Volt in the second channel. These voltages are adjustable in the range between 1.2 and 30 Volts in each channel. Janus does not provide 60 Volt output. Janus provides two voltage outputs +30 Volt and -30 Volt, measured against ground. The LM regulators determine the output voltages. 2. Which Hammond transformer would be best for that application? Janus is designed for use with transformers that have two secondary windings and a centre tap. The AC output of each winding has to be between 24 and 26 Volt AC (for example 182H9 and 182L12). 3. Can "soft start" be added, like in the other PS boards? In this range of voltages (+/-30 Volt) it is not required. 4. Is there anything that can/should be done to improve the buffer boards? The boards appear to be of good quality. 5. Is the Janus the best choice for this application? This is a decision you have to make yourself based on the requirements of your project. The parameters of Janus are disclosed on its URL.